A Canadian groom and his cousin who are imprisoned in the Dominican Republic threw punches in a post-wedding brawl last month, according to court documents. Two Canadian men who have been imprisoned in the Dominican Republic threw punches in a post-wedding brawl last month, court documents say. 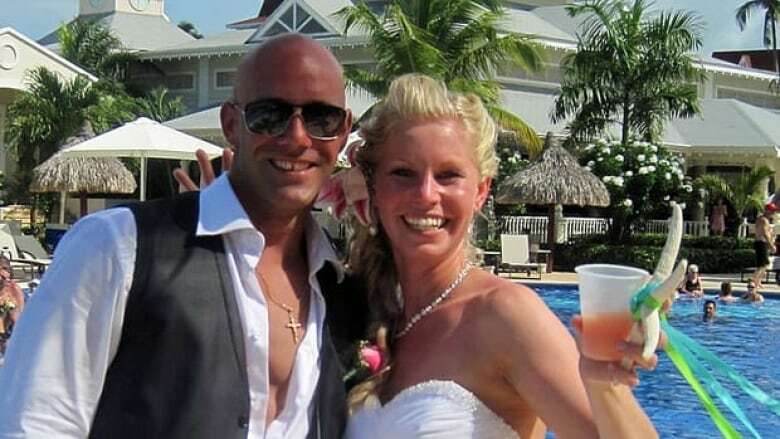 Nick Miele, 34, and his cousin, Ben Constantini, 18, both of Stoney Creek, Ont., have been behind bars since the early- morning hours of May 28 — just hours after Miele and Stacey Vernon were married at the Bahia Principe Esmeralda resort in Punta Cana. Vernon says her husband and his cousin were thrown in jail unjustly after a fight broke out on their resort between two Canadian men they didn't know. Canadian Consular Affairs says one of the two men was seriously injured. But according to a written statement by the wife of the seriously injured man — a statement found in Dominican Republic court documents — both Miele and Constantini were involved in the fight. "I saw some people jump on my husband," the statement reads. "[Miele] hit my husband and another person — the other guy was pushing him. He was on the ground. I was telling them to stop hitting him." The injured man sustained trauma to the head, bruising and some superficial injuries, according to a medical report attached to the court documents, signed May 30. The Canadian government will not divulge the identities of either of the two other men, citing privacy concerns. Vernon said as far as she knows, the injured man left for Canada on May 30. But these weren't the only Canadians on the resort that night. Jennifer Schanck from Burlington, Ont., was there too, and says she saw some of the fight. "I was just shocked at what happened," Schanck told CBC Hamilton. The fight broke out on her first night on the resort, and she could hear it happening as she approached the beach bar, she says. "We could hear people screaming, and dishes were breaking," she said. She said she saw Miele "defending himself from this guy who had fallen on his wife." She says she did not see Constantini. "Then from behind me, from out of nowhere, this guy is screaming in what sounded like Russian," she said. "He just flew in and drop-kicked this other guy. It was unbelievable. I thought he was dead." She says there were about 30 to 40 people in the area at the time. "All the staff just stood there and watched. It was horrific," she said. Schanck said the injured man's wife seemed intoxicated at the time of the fight, and that she had never met any of the people involved. "That incident will never leave my mind," she said. Repeated requests for comment from both local police and the Bahia Principe Esmeralda resort in Punta Cana were not returned. In a statement, Minister of State of Foreign Affairs (Americas and Consular Affairs) Diane Ablonczy told CBC Hamilton that the Canadian government is working with Miele's family, their lawyer and local authorities. She says the federal government is "advocating for fairness and due process for both Canadian parties involved." "While guilt or innocence has not yet been determined, Dominican officials assure us they are investigating as per their own sovereign laws in order for justice to be properly served," she said. According to court documents, Miele and Constantini are being held for a three-month period so authorities can gather evidence and because they are considered a flight risk.